How do I open parts in Diary missions? When building your mission, you have the option of opening parts to scouts automatically or manually. This setting cannot be changed once your mission is launched. If you choose to run a manual mission, you will control when subsequent parts are opened for your scouts, so it’s important to monitor the progress of your scouts in the Manage page, and open new parts for them when appropriate. When you launch a manual mission, only the first part is published and opened. 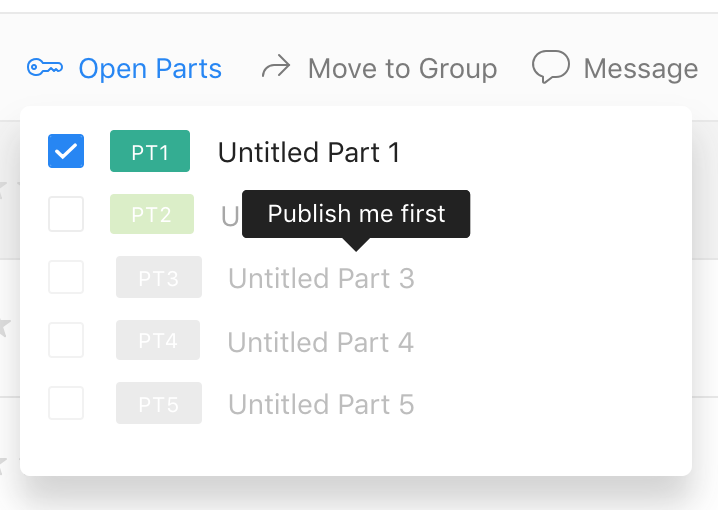 To publish a subsequent part, navigate to the setup page, select the "questions" tab and click the green Publish button on the top right corner of the screen. Then, navigate to the Manage page to open that part for them. Parts must be opened consecutively, and all scouts will see all parts in your mission! This means that if, for example, you open Part 4 for a group of scouts, Parts 2 and 3 will necessarily be opened for them as well. You may edit parts that have been published, so long as they have not been opened to scouts yet. If you edit a part that has been published, you will simply need to publish it again to be able to open it to scouts. If you choose to run an automatic mission, as soon as scouts complete the required number of minimum entries for a part, the next part will automatically open for them. In other words, as soon as you launch an automatic mission, all its parts are published & opened to scouts.